[SOLVED] Cleaning old dusted/greased tools with gasoline? I would try wd40 spray first before you blow yourself up with gasoline. Or brake cleaner for all that dust residue. 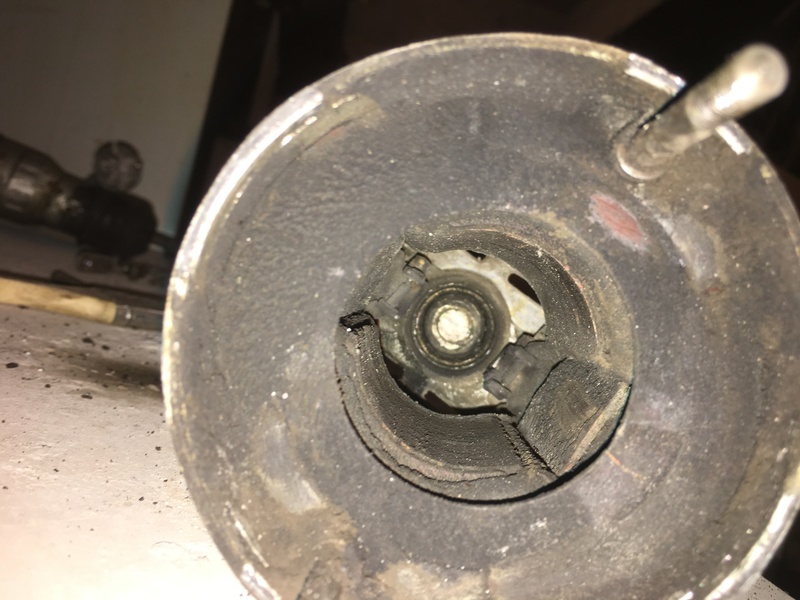 biggest issue with using gas is that it will not only eat away the grease and grime but will also eat away at any rubber bushing and seals that may be there. they are likely already pretty cracked and in need of replacement but soaking them in gas will only speed this deterioration along. now if you dismantle it, then you can go nuts on the metal parts with any kind of gunk remover or gas if you wish. but do avoid soaking the rubber pieces with gas as it can do more harm than good very easily. It does not have any rubber bushings tho the ball bearings are open types. But good point of not using gas from both of you. Do you have access to Gunk cleaners? They work great and you just rinse them off with water. Brake cleaner or choke and carb cleaner will also just melt that stuff off but it's more caustic. WD 40 was devolped to prevent rust and corrosion on Atlas rockets. So it is not combustible. It is a water displacer /grease solvent and can also be used for lubricating etc. It is called wd-40 because the inventor got the mixture right on his 40th try. However, the formulation was changed quite a few years back and many of the original properties are not as they once were. WD 40 isn't much of a degreaser. ^ The WD 40 degreaser is NOT the same product as what you quoted. That's a specialty degreaser. So what's your point? it says wd-40 on it yes? And my point is both are used as degreaser take your pick. A few comments, by somebody who uses old woodworking and metalworking equipment on a near-daily basis. 2. The drill in the video looks to be made in the 1950s or 1960s, it was made much earlier than the 1990s. The motor in the drill in the video used varnished insulation on the field windings and thermoplastic insulation on the cord wires, which appear to be original and would date the drill to after WWII. The case design and construction would date it to before about 1970. 4. The picture you posted appears to be the end bell of a handheld drill and shows the brushes of a universal motor. The brushes contact the commutator on the rotor and have nothing to do with the stator (field windings.) The stator is the device that the guy in the video knocks out of the casing of his drill at about 1:30 and then reinstalls at 8 minutes in. 5. I would use a few shots of brake parts cleaner or carburetor cleaner to degrease this part. Gasoline would work but is much smellier and not nearly as effective as brake parts cleaner, it is highly flammable, and takes longer to evaporate. I do not recommend using gasoline for anything except for a fuel as there are much better solvents out there to use as solvents. Brake parts cleaner is much better, even the nonchlorinated stuff that they can sell in California and the Northeast (which is about 50% xylene or toluene and 50% methanol) still works very well, so does the original tetrachloroethylene version we can buy in flyover country. 6. WD-40 is primarily Stoddard solvent and other light petroleum distillates, so it will work somewhat as a degreaser (again, not as good as an actual degreaser like brake parts cleaner), and is in fact quite flammable. 7. Do not spray brake parts cleaner or carb cleaner on anything plastic/plasticy/synthetic. Spraying it on the actual stator of your motor will dissolve the winding insulation and ruin the motor. It will also remove any and all paint it gets into contact with.